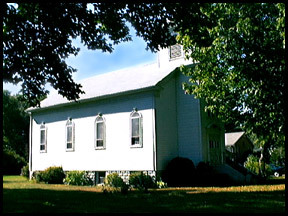 We are a small, active Eastern Catholic parish located in the quiet town of South Deerfield, Pioneer Valley in north western Massachusetts. 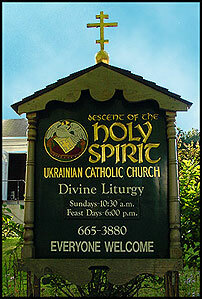 Founded in 1920, by men and women of deep faith from Western Ukraine, who like other Ukrainian Communities in the USA wished to have their own Ukrainian Catholic Church. As in Ukrainian communities throughout the North East, they asked their bishops in Ukraine that they too might have all that is Holy in Rusâ€™-Ukraine for themselves and for their children. The presence of our parish church was seen a vital part of the lives of those first members because it was their way to life of Holiness and Salvation. It is as true today in this 21st century as it was in the year 988. Now this parish reflects people of varied ethnic backgrounds who have been drawn to the church because of its beautiful Byzantine-Ukrainian heritage. In the past the parish was called Descent of the Holy Ghost until recent years when it became Descent of the Holy Spirit. Fr. Robert Markovitch, MD is the present pastor and administrator. Please read the DHS History, and I hope you enjoy your visit to our site.